A few weeks ago, reformy types got all excited when Diane Ravitch mentioned that the heroic teachers at Sandy Hook were part of a union. Some of us thought that was significant, since every day brings us a new story about the perfidy of unionized teachers. But reformy folks went all Amazing Kreskin on Ravitch, saying what she meant was non-unionized teachers are not heroic. Furthermore, she was only advancing her own personal cause, promoting the teacher union. That Ravitch does not belong to a teacher union was neither here nor there. This caused a lot of discussion on Twitter, on this forum, and elsewhere. Reformy folks prohibit any sort of speech that leads to conclusions they have not already made, and they reserve the right to declare what writers have in mind, even if writer's words bear no actual resemblance to their conclusions. After all, they must know best, or why would folks like Bill Gates and Mike Bloomberg have all that money? In short, we are prohibited from saying anything they may deem offensive, or anything they may infer to be offensive, no matter how outlandish their inferences may be. However, if you are a reformy type, like, say, Mayor Michael Bloomberg, the rules are different. Basically, you may say anything, no matter how outlandish, and if it happens to be overtly offensive, so much the better. For example, the other day Mayor Bloomberg compared teacher unions to the NRA. Apparently, after an unspeakable atrocity involving guns, one in which unionized teachers sacrificed their lives to protect children, it's okay to compare them with a group that advocates more access to the firearms used in taking the children's lives. Now let's get to the actual comparison. Mayor Bloomberg says most NRA members are not on board with NRA policies. I have no idea whether or not that's true, nor did Mayor Bloomberg support his statement with any cites or stats. He goes on to suggest that most teachers want a new evaluation system, and that they assume this as-yet unestablished system will somehow result in better teachers. First of all, I don't know a single teacher, a single working person who gets exercised about lack of evaluation. "Gee, I wonder whether or not I'm doing a good job. I can't tell because I have absolutely no way to determine whether or not I'm working hard or goofing off." Few teachers say, "The only way I can determine whether or not I'm doing a good job is by the scores my students get on tests I did not write." The exception, of course, is the fifth columnists over at E4E who support every reformy thing that comes down the pike. Otherwise, how would they get gigs running E4E rather than wasting their time in classrooms like the rest of us. Since they're likely the only teachers (or ex-teachers) Tweed bothers to talk with, it's understandable that Mayor Bloomberg may take the position their views are representative of working teachers. And it is nothing less than disgraceful and disgusting, at this time, that he would muster the audacity to compare working teachers with gun advocates. 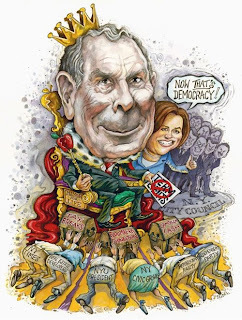 If Mayor Bloomberg had any character, he'd resign. And if he had one iota of conscience, he'd publicly apologize to the tens of thousands of working teachers he outright slandered.